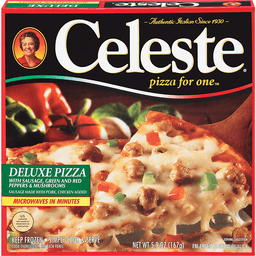 No nitrites or nitrates added except as naturally occurring in sea salt & celery juice powder. Whole milk mozzarella cheese. 100% profits to charity since 1982. No artificial flavors. US inspected and passed by department of agriculture. 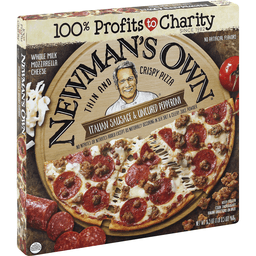 Newman's Own Foundation continues Paul Newman's commitment to use all royalties and profits that is receives from the sale of this product for charitable purposes. Paul Newman and Newman's Own Foundation have given over $500 million to thousands of charities since 1982. Learn more at NewmansOwnFoundation.org. Since 2010, Newman's Own Foundation has committed over $18 million to organizations that support military personnel, veterans, and their families. Below is one example of this support: Farmer Veteran Coalition: Farmer Veteran Coalition cultivates a new generation of farmers and food leaders, and develops viable employment and meaningful careers through the collaboration of the farming and military communities. The largest and oldest national organization devoted entirely to helping veterans find work in the farming and ranching sectors, Farmer Veteran Coalition believes veterans possess the unique skills and character needed to strengthen rural communities and create sustainable food systems. Visit farmvetco.org. 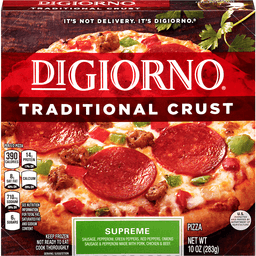 Only the Finest Ingredients: 100% real cheese; cheese from the milk of cows not treated with rBST (No significant difference has been shown between milk derived and rBST-treated and non-rBST-treated cows); multi-grain curst; in crust we trust. Visit NewmansOwn.com for more food information. Carton made from 100% recycled paperboard. Handmade thin & crispy pizza baked in a wood-fired oven. Pulled pork, pineapple, and jalapenos over cheddar cheese and tomato BBQ sauce. US inspected and passed by Department of Agriculture. The elements of food become. The elements of ourselves. Tucked away in the White Mountains of New England, artisan bakers work an earthen oven formed with clay. Here, from the union of fire, rock and the finest ingredients comes a carefully prepared handmade flatbread that is truly light, crisp, flavorful and wonderfully convenient. 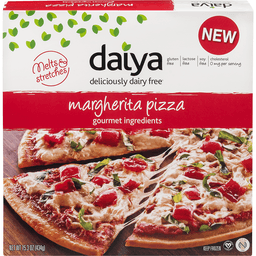 This is a pizza that's both good and good for you. 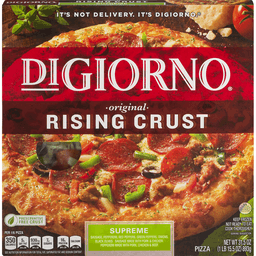 This is a pizza with integrity. Pulled Pork, Pineapple + Jalapeno: Sweet pineapple and fiery jalapeno meet smoky pulled pork on this delightfully handcrafted pizza. We hope you enjoy our honestly delicious flatbread as much as we do (and that's a lot!). 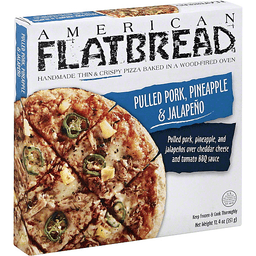 - The American Flatbread team. Unconditionally Guarantee: If for any reason you are not satisfied with our product please call us toll free at 888-519-5119 or email us. 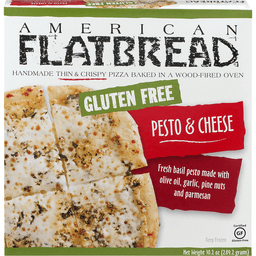 www.AmericanFlatbreadProducts.com. Products of the USA.